Speaking of pioneers, I have to admit the recent Mars probe landings have captured my interest. 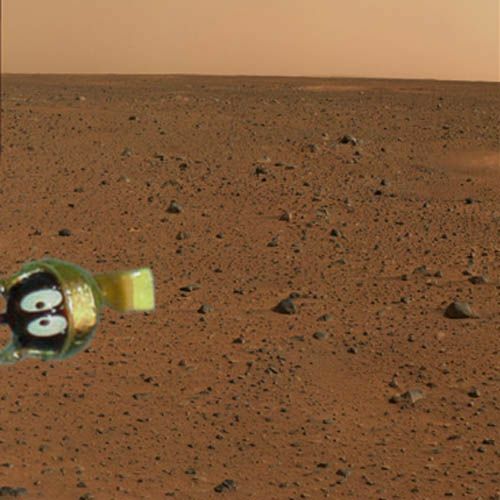 But I really got excited when I saw this early image sent back from the NASA rover. Any rumors concerning the whereabouts of the Illudium Q-36 Explosive Space Modulator? It is always a joy to hear from your postings. Keep it coming. If God's Creation is this awesome, how much more powerful must HE be? I don’t know if I’d lend that image too much credence. It was color-corrected, which is the first sign of tampering — who knows what else they’ve done to it. They might even have staged the whole thing in some desert in Nevada. I’m no photo expert, and I try to avoid conspiracy theories, but I suspect that there might have been some modifications made to the image with some sort of high-end, government-only image-manipulation app, but that’s just my skeptical side talking. I’m not saying it’s *definitely* fake — rather, I think we should wait for a deeper analysis before passing judgment. That said, I hope that what we’re seeing in the image isn’t just glare on the lens or a practical joke.